The capital of the country is Tashkent (“stone city”), situated in the foothills of the Tien Shan mountains, in the center of the flourishing oasis in the valley of the Chirchik river. For many years Tashkent had been the crossroad of different trade tracks, and it formed the extremely various appearance of the city. 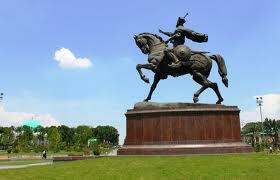 The first information about old Tashkent appeared in the ancient eastern chronicles of the II century BC. The caravans traveling along the Great Silk Road, were passing through the prosperous city Shash (ancient name of Tashkent). The Chinese sources refer it to Yuni, and in the famous inscription on the "Kaaba of Zoroaster" (262 BC.) it is mentioned as Chach oasis. The manuscripts say that in ancient times there were beautiful palaces among green gardens, mosques and shady streets. In the VIII-XI centuries the city was called Binket. At the beginning of the XIII century, on the eve of the Mongol conquest, the oasis of Shash was almost completely destroyed by the troops of Mukhammad Shah of Khorezm. In the XIV-XV centuries the city again revived as a commercial and cultural center of the empire of Timur and the Timurids, growing rapidly in the south and east, becoming one of the largest cities of the time. During its existence Tashkent suffered the ups and downs, but always remained at the crossroads of international trade, and was the center of the unique Central Asian culture. The favorable location determined the choice to make it the capital of the republic. The terrible earthquake of 1966 almost completely destroyed the city. However, thanks to the miracle and, somewhere, hard work of local people and help of all republics of the USSR, the city was practically rebuilt over again for 10-15 years; and now it is one of the most picturesque cities in the region. 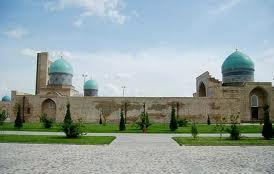 Very few historical buildings, mosques and mausoleums remained from old Tashkent. However, today people are surprised by narrow streets, low adobe buildings, mosques and madrassahs (Muslim educational establishments) of “old city” or as it is called here – “eski shakhar”. The best examples of ancient architecture of the capital are: Sheikhantaur ensemble consisting of three mausoleums – Yunus-Khan (XV c.), Sheikhantur (XV-XIX c.) and Kaldirgach-Biy (XV c.) with its famous dodecagonal pyramidal domes; and Zainutdin-Bobo mausoleum (XVI c.), Sufi-Ota mausoleum (XVI c.) and architectural ensemble Khazrati-Imam (XVI c.). The remained cultural structures are: acting madrassah Kukeldash (XIV c. lately reconstructed), madrassah Abdul-Kasim-Eshon (XVI-XIX c.) and also Khast-Imam (Khasti-Imom) ensemble with the madrassah of Barak-Khan (XVI-XVII c. on the building foundation of the XV century) and the institute of Al-Bukhari, located in it, the mausoleum of Kaffali-Shash (XV c.). The picturesque mosques of Jami (Juma, XVI c.), Mirza-Yusuf (XIX c.), Khayrabat-Eshon (XVIII-XIX c.) and Sheykh-Tilla mosque on Khast-Imam square are also of interest. There are also some orthodox temples, the nunnery, churches and even the Catholic kostel in Tashkent. The tolerance of the local rulers has always been widely known outside the country. The following places are worth of interest. They are: museum-house of a prominent Uzbek leader, the theologian and politician of the XV century Khoja Akhror Vali, the square and the park of Amir Temur, surrounded by the government buildings the Mustakillik Square (Independence Square), Tomb of the Unknown Soldier, the Memorial of the victims of the earthquake in 1966, the square of the Peoples' Friendship with the Concert hall, the Parliament building and the sculpture of the Shamakhmeds, a large park and the monument to Alisher Navoi, squares Khasti -Imom and Khadra, the exhibition center UzExpo with a nearby water park, the circus surrounded by the fountains, the former residence of the duke Rakhmanov (XIX century) with chimes and the TV Tower (1979 -1981 years, the tallest building in Central Asia, it reaches a total height of 375 m.). There are many museums in Tashkent, among which the most interesting are: State Art Museum with the extensive collection of paintings, ceramics, royal regalia and "syuzani" ("suzanne", embroidered in the Persian style decorative panels), the State Library, a new Museum of Amir Timur, Museum of History of Uzbekistan, Uzbek Museum of Applied Arts (opened in 1937, about 30 thousand of handicraft samples and jewelry), Museum of Literature, Historical Museum of railway, and many others. The world famous Opera and Ballet Theatre named after Alisher Navoi with a beautiful square in front of it, The Conservatory, 9 theaters and many other cultural and educational institutions deserve their close attention. As elsewhere in the East, there are many bazaars and city markets in Tashkent, among them the oldest bazaar Eski- Juva is considered as the best one, and Chorsu bazaar near Kukeldash madrassah. Zangiata village lies 15 km. 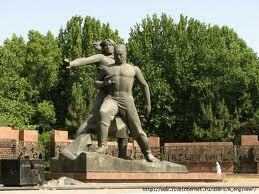 to the south of Tashkent. Two ancient mausoleums – Zangiata and his wives Ambar-Bibi (Kambar –Ana, XIV century) are located in the village. It has a vast garden, a complex of monumental buildings of XIV-XIX centuries, the madrassah (XVIII -XIX c.), the mosque (1870), with a minaret (1914-1915) and the ancient cemetery.